Trolleys are one of the most convenient means of transportation and carrying of the heavy goods and items from one place to another. We are one of the very well known companies which are widely engaged in the line of manufacture, supply and provide the services for the most excellent quality industrial material handling equipments which also includes these high grade trolley wheels. 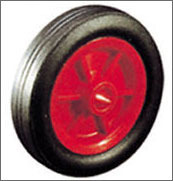 These trolley wheels are manufactured using most tough and strong quality rubber materials which makes them reliable and smooth for a hassle free movement. Leveraging on our well developed manufacturing unit and experienced workforce, we are able to fabricate the range of Conveyors and Material Handling Equipment. Our range of equipment that we offer includes Slat Conveyors, Apron Conveyors, Idlers, Pulleys, Belt Conveyors, Bucket Elevators, Screw Conveyors, Chain Conveyors, Ball Transfer and Aviation Ground Supporting Equipment. All these are conveyors and equipment are fabricated using quality stainless steel and mild steel which is procured from reliable vendors of the market. Our range is highly demanded in several industries, such as sugar, cement, pharmaceuticals and marine for its high end features like corrosion resistance, tensile strength and durability. With the help of sophisticated machines, we manufacture our range which is at par with international quality standards. Apart from this, we also provide the facility of designing, manufacturing, engineering, supplying, exaction and commissioning of Crushing plants on turnkey basis. Our turnkey Fabrication Services includes Marine Fabrication Services. These services have enabled us to cater to the demands of various clients including Grasim Industries, Mineral Enterprises Pvt. Ltd., Mysore Paper Mills Ltd., Essar Constructions Ltd. and ECI Constructions Pvt. Ltd. spread across the country.